" Victoria BC Vacation "
Victoria BC is a vibrant and colorful city. Summer is perfect. Do you know Victoria is the Canada’s warmest spot in January? 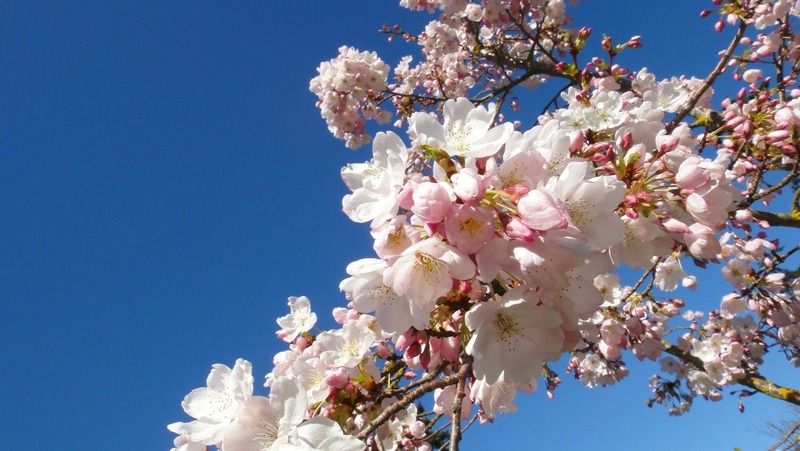 You see ... February is the month that cherry blossoms bloom in Victoria. This is a beautifully landscaped city. No wonder people visiting here like to revisit again and again and quite often buy a house and finally settling down. We have had experienced all the excitement Victoria has to offer all year around ... We truly live in this beautiful city. All our experiences are updated on this site through our eyes – for you to read and hopefully to enjoy very soon. Downtown Victoria is very special. Our downtown is connected to so many activities. Whale watching, Scenic Seaplane Tours, Horse Carriage Tours, Double Decker bus tours, Day trips to world famous Butchart gardens etc. We even have a bus that takes you on a day trip from downtown to Mount Washington Alpine Resort for skiing 7 days a week during winter. Remember, you can walk to many world-class attractions from Downtown. Legislature building, Royal BC Museum, Government House are all within walking distance. Walk to downtown IMAX Theater - ultimate movie experience for you to enjoy. Walk to Canada's oldest Chinatown. Fan Tan Alley in Chinatown is the narrowest street in Canada, See floating homes at Fisherman’s Wharf or just walk along the scenic harbor or walk to Beacon Hill Park during summer. Kids favorites ... See the world's smallest operational sawmill at Miniature World, Walk into the amazing world of insects and spiders at the Victoria Bugs Zoo. I know kids love to see the petting zoo at Beacon Hill Park and seal feeding at the inner harbor. When we walk to petting zoo at beacon hill park or seal feeding at inner harbor with my daughter, it is never ending fun time for her. Spring and Summer are the best seasons for Roses, Dahlia, Daffodils and variety of flowers. This brings so much color to Victoria BC. 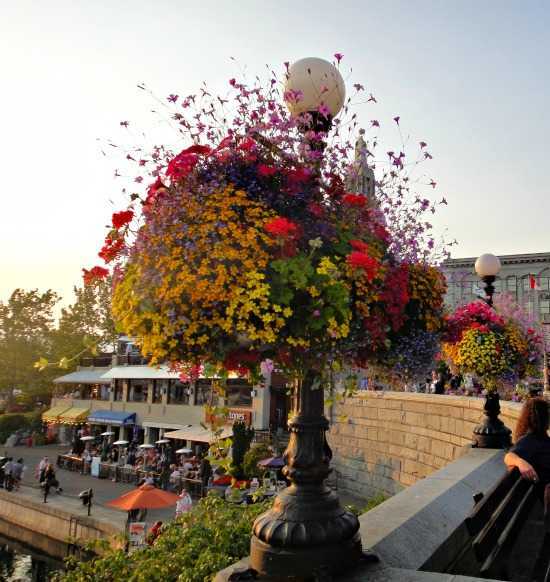 Downtown is famous for display of colorful hanging baskets during Summer months. Capital of British Columbia – Victoria BC is on Vancouver Island. It lies just off the southwest corner of mainland Canada. Easy ferry ride from Vancouver BC – Tsawwassen. I moved here first, later on my wife Chammi. Lapaly, our daughter a born “Victorian” girl. My very first trip to Vancouver Island from Toronto gave me a good feeling. The Victoria International Airport is a charming spot with a friendly Airport staff. Flying here was pure fun. Mountains, ocean views, natural and scenic beauty of landscape made me fell in love with Canada's garden city. Chammi came to the island sometime later... As a new immigrant to Canada. She sailed BC ferries from Vancouver to Victoria. My journey was long but the best part of it was ferry ride to the Island. It was a fabulous trip itself. I was thrilled to see a pod of whales and bald eagles - Chammi. My cousin on a short business trip to Vancouver decided to take a different route to visit us. For a quick one day trip from Canada or from U.S.A he found out flying directly to downtown is the best. He took Harbour Air flight and landed directly at downtown harbor. We met him there. Half an hour after landing he was having lunch with us and feeding wild seal at the Fisherman’s Wharf. Victoria has been all year around vacation spot that offers a friendly place to unwind, a place to experience thrilling adventures. It's truly a haven for visitors and tourists of all ages. It's no surprise that this is one of the world's favorite destinations. There are world class hotels, restaurants and resorts, shops and activities for all ages. 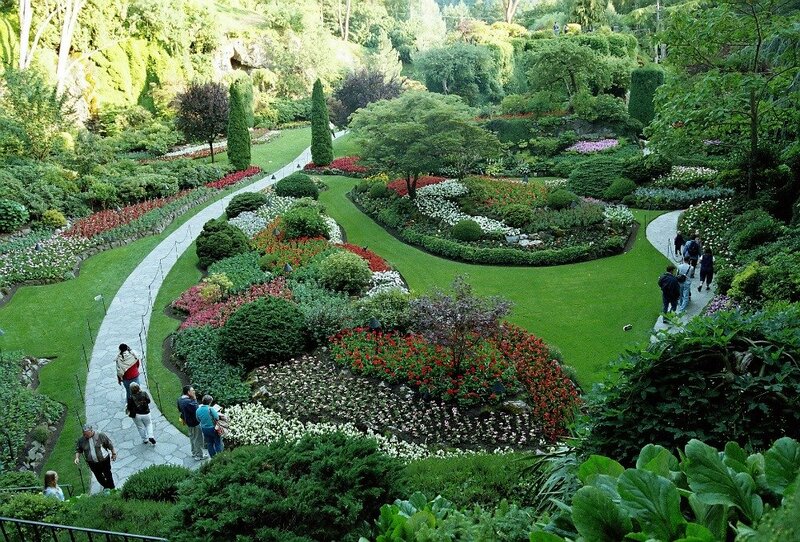 If you are planning to come here in Summer, keep in mind not to miss out Butchart Garden's fireworks. Absolutely superb fireworks for everyone to be enjoyed. I have never seen this type of fireworks in my life because this is unique and creative. December you see the magic of Christmas - billions of light decorations throughout the garden. Don't miss out these places; Hatley Castle, Craigdarroch Castle, Shaw Ocean Discovery Center - an aquarium and marine education center. Planning To Live Here And Settle Down? Canadians love to be here. Real estate values in Victoria are some of the highest in Canada. However, If you move here, there are still fabulous spots to build your dream home. We have been exploring Victoria BC for the last few years and find new things to do always. There’s exciting news and events to write about every day. Visit our site often to see more Updates.